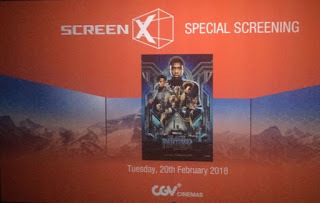 A couple nights ago, my wife and I were few of the fortunate people who were having the opportunity to join the special screening of the movie Black Panther (my review of the movie was already posted last week in here) at the very cool ScreenX studio. What is ScreenX? 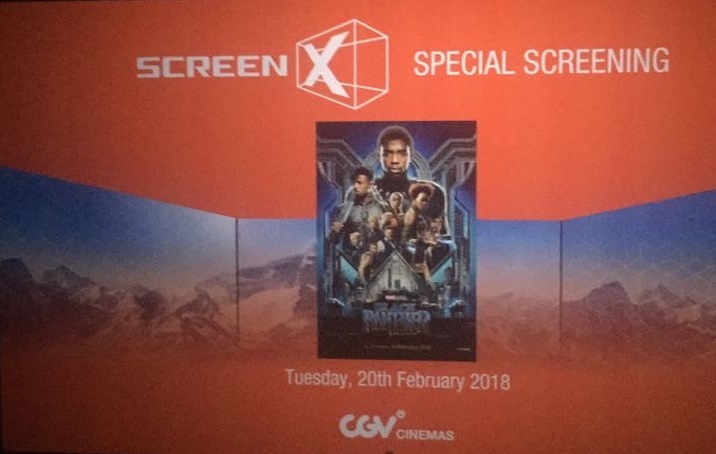 According to CJ CGV website, ScreenX is the first in the world multi-sides screening system jointly developed with KAIST where the three screens including the front and two sides offer maximum 270 degrees of sight to audiences. After registering ourselves at 6.30 PM, we had brief dinner first till 7 PM where all of us were asked to go inside the studio. Before the movie started, we were greeted by Wisnu from CGV who informed us that the ScreenX studio in CGV Grand Indonesia, was one of only 101 such cinema in the world and the only 1 in Indonesia. So it was definitely a very special experience to try and see this. Actually this was not the first time my wife and I saw a movie in this studio. We had done it before when we watched Pokémon the Movie: I Choose You! few months ago. But that time the movie did not have the 270 degrees effect. This time, the movie was designed for such purpose. In fact, it was the first movie from Marvel studio to be released in the 270-degree ScreenX format. When the movie finally started, all of us in the studio were totally immersed with the effects. Though it was not 100% whole movie were shown in such format, some of the important scenes were having that effect. It was totally amazing to see the scenery of Wakanda country in the front, left and right side of the wall. It made us feel that we were really inside the country. Some other scenes that were having those effects were fights in Korea or the planes flying in Wakanda (which was definitely the best scene of all), or during the "trip" T'Challa went to after he ate the heart shaped herb which kind of reminded me of that colorful Avatar world. Basically when you see this kind of movie in such format with those effects, you would be having the feeling of thrown into the world that the movie tried to show us. I know that it would probably be a little bit difficult to imagine, or you may also think that I exaggerated, but you really got to try and see & experience for yourself. For your reference, I am putting down a link below from CGV itself of how amazing the scenes would be seen in this screen: ScreenX promotion from CGV. In case you are wondering, the studio itself was not too big. Rather than the usual very wide screen in front of you, it was actually having a normal sized screen and only when it was better to have it in 270 degrees format, the film would changed automatically. So if a movie does not have those effects, the studio would feel just like a normal one. Btw, I wonder if the whole movie was put in such effect. But I guess we will never know cause probably it is too expensive to do so. And besides most likely audience would be feeling too tired. Oh another thing that could have been made better was the sound system. I do think it could use a little bit upgrade (perhaps to a Dolby Atmos system?). Anyway overall it was a wonderful experience. Certainly one of a kind. Be sure to try and catch this one and only such cinema in Indonesia to see Black Panther especially if you are one of those audience who loved the movie so much. And who knows this would be the start of many more movies with 270 degrees effect that would be best seen in ScreenX. PS: Special thanks to CGV (Cempaka, Wisnu and the rest of the team) for this nice event! Hope to have more of similar experience with CGV in future.